Labour leader Jeremy Corbyn visited Peterborough today to make a key speech to party members and the national media. 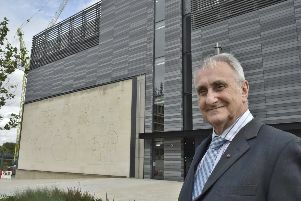 But when the television cameras were put away and the 100 or so people who crowded into Paston Farm Centre had dispersed, the Peterborough Telegraph sat down with him in a side room to talk about key issues in the city. Q: Why did you choose Peterborough to make your New Year’s speech today? Q: Is Peterborough a key seat Labour is targeting in the next General Election? Q: You’re obviously aware of the St Michael’s Gate issue and Peterborough City Council’s plans to move homeless people into homes where 74 people have been evicted, and the Peterborough Telegraph’s petition against this. What would you do differently? Q: Immigration remains a hot topic in Peterborough. What would you say to residents who have struggled to get a GP appointment or struggled to get their child a place in schools because of the pressure immigration has put on the city’s infrastructure? Q: If you don’t think we need to stop the number of people coming into this country how do you respond to people who have concerns about it? A: By pointing out the under investment in our services, but also by pointing out the work that is done by European migrants working within our health service and education service, so the question of under-funding of services is crucial, so in this city, in Peterborough, this council seem to be more interested in selling off council housing to a private sector organisation rather than housing people that are homeless and need to be housed. Q: So you say if there was more funding in services people wouldn’t be so concerned about the level of immigration? Q: What is new about the announcements you have made today? A: “What is new about is we are there campaigning on market access in Europe, about the fact that we are there about investment in a growing British economy, and that we are there challenging the under-funding crisis within national services.